Just plug our interface box into your computer with the supplied USB cable - no drivers needed. Fire up our FREE Easy Quiz software on your Windows PC or MAC. There's no messy software installation - it just works! Type in your player or team names and you're DONE. Let the quiz games begin! Also works with Game Show Presenter or any other quiz game software that recognizes the number keys 1-10 and provides a buzzer lock-out function. Two year warranty against manufacturing defect under normal use of this product for conducting quiz game events. No other warranties expressed or implied. Our top selling flagship product is rugged and affordable. Team Play buzzers can be shared by multiple team players. Now available in a wireless version! will be used with these buzzers? such as specific buzzer numbering. BIG DADDY table-top buzzers are like nothing else you'll find at affordable prices. These monsters are big, bright and rugged; perfect as team play buzzers for sharing among team players or just to magnify the action as your players jump to be the first to buzz-in. Your audience will howl with glee as they watch your players race to whack these red behemoths. Measuring nearly 5 inches in diameter and 3 inches in height, these babies will delight both your quiz game contestants and your audience. Wires are detachable for easy storage. 10' wires standard, 25' wires available. BIG DADDY buzzers are also available unbranded with plain red button tops, for an additional fee. Your BIG DADDY Buzzer system is a sack full of fun! Featuring 10 team capability and gigantic table-top buzzers, you can accommodate a roomful of players. Just fire up our free Easy Quiz software or your own compatible software such as Game Show Presenter for the ultimate quiz game experience. Wires are detachable for added convenience when storing your system in the free carry sack. Big Daddy buzzers are supplied with individual flip top boxes to keep your buzzers clean, bright and ready for your next quiz event. FREE Easy Quiz Software for your Windows PC or MAC facilitates verbal quizzes so you can use your system for any last minute event. Our free Easy Quiz software uses your computer to enter player names, display the first player to buzz-in, then optionally displays a cheerful "Right!" screen for the right answer, or the dreaded "Wrong!" screen for a wrong answer. It's fast, simple and loads of fun! FREE Carry Sack - To seal the deal, we'll include this roomy carry sack for your buzzer lock-out system. The top opens fully to allow easy loading of all your game gear. This handy carry sack keeps everything together and ready for your next quiz game event. Yep - it's even big enough for all 10 Big Daddy Team Play buzzers, cables and the interface box. Wireless Host Remote permits operation of our free Easy Quiz software from up to 30' away. With just 2 buttons, you can activate the buzzers for your next question, respond to player answers with the right/wrong screens, and advance to the next question, all without ever touching your computer keyboard. For use with our free Easy Quiz only. Not compatible with 3rd party quiz game software. 10 teams - a roomful of players! POWER GRIP Hand-held buzzers - feature a no-slip design that feels great in your hand and strangely empowering! Easy operation with either your thumb or trigger finger. Molded from ABS plastic, our Power Grip buzzers are made to last. An RCA phono jack in the tail of the buzzer makes cable connections easy and storage convenient. Cables themselves are made with factory molded RCA phono plugs assuring maximum durability. 10' cables standard, 25' cables upgrade available at checkout. Power Grip buzzers are also available in a wireless version. No "starter kit" nonsense here. Your Affordable Buzzer system comes with 10 player capability and 10 hand-held buzzers and is ready to go! It's a party in a box just waiting for you to fire up our free Easy Quiz software or your own compatible software such as Game Show Presenter for the ultimate quiz game experience. FREE Carry Sack - To seal the deal, we'll include this roomy carry sack for your buzzer lock-out system. The top opens fully to allow easy loading of all your game gear. This handy carry sack keeps everything together and ready for your next quiz game event. Yep - it's even big enough for all 10 "Big Daddy" Team Play buzzers and the interface box. Up to 50 wireless buzzers in a quiz! Wireless BIG DADDY table-top buzzers are like nothing else you'll find at affordable prices. These monsters are big, bright and rugged; perfect as team play buzzers for sharing among team players or just to magnify the action as your players jump to be the first to buzz-in. Your audience will howl with glee as they watch your players race to whack these colorful behemoths. Measuring nearly 5 inches in diameter and 3 inches in height, these babies will delight both your quiz game contestants and your audience. With a range of 50ft. per buzzer and a maximum of 50 buzzers per quiz, you can include an entire banquet or conference hall in your next quiz event. Mix & match with the POWER GRIP hand-held model in the same quiz with a single, supplied USB receiver. Three AAA batteries are pre-installed so your buzzers are ready to go right out of the box. The power switch preserves power when stored between quizzes. Please specify your order quantity in the shopping cart. Up to 50 wireless buzzers can be used with our free Easy Quiz software. Click here to add special instructions to your order such as specific buzzer numbering. Our new Wireless 4-Buzzer Color Pack includes 4 Big Daddy buzzers in the colors shown, 1 wireless USB receiver, 1 carry sack, and our free Easy Quiz software. This 4-Buzzer Color Pack is the perfect companion for Speed Trivia and The Eliminator from CrowdControlGames or any other buzzer games requiring up to 4 buzzers. POWER GRIP Hand-held buzzers feature a no-slip design that feels great in your hand and strangely empowering! Operation is easy with either your thumb or trigger finger. Molded from ABS plastic, our POWER GRIP buzzers are made to last. Wireless capabilities are identical to the Big Daddy table top buzzers and work with a single, supplied USB receiver so you can mix & match this POWER GRIP model with the BIG DADDY model in the same quiz. Two AAA batteries are pre-installed so your buzzers are ready to go right out of the box. The power switch preserves power when stored between quizzes. 50ft. range accommodates large banquet or conference halls. Please specify your order quantity in the shopping cart. Up to 50 wireless buzzers can be used with our free Easy Quiz software. Wireless USB Receiver is included with your order, so no interface box is needed. Every order for 2 or more of our wireless buzzers comes with a wireless USB receiver to communicate directly with your computer. One receiver handles up to 50 buzzers when using our free Easy Quiz software. We'll configure all your wireless buzzers to work with the USB receiver before shipment so all you'll need to do is plug and play! Our system also works with Game Show Presenter or any quiz game software that recognizes the number keys 1-10 and provides a buzzer lock-out function. Please note that only our free Easy Quiz software will support buzzers numbers 11-50. FREE Carry Sack - To seal the deal, we'll include this roomy carry sack for your buzzer lock-out system. The top opens fully to allow easy loading of all your game gear. This handy carry sack keeps everything together and ready for your next quiz game event. Each carry sack is big enough for 24 Wireless Big Daddy buzzers, so we'll include as many as you need for the quantify of buzzers you order. NEW! Optional voice downloads of various dialects permits Easy Quiz to speak at every sound event. Click here or check under the Accessories tab. Use "Add to Cart" button to download our FREE Easy Quiz software. The Menu screen will appear when you first start the Affordable Buzzers Quiz Game. Enter Player Names: Allows you to enter the names of all your players or teams. Test Buzzers: Allows players to test their buzzers before you begin your quiz. Begin Quiz: After your player names have been entered, this button will begin an actual quiz game. Display Player Scores: Use this button to display and/or edit the scores for all players. Quit Game: Exit the Affordable Buzzers Quiz Game. The Enter Player Names screen is where you type the name of each of your quiz players or teams and assign them a buzzer number. Whatever text you enter here will appear on the screen during game play to identify the player who was first to press their buzzer for any given question, that is, the first player to “buzz-in.” You may use actual names, nicknames, team names, etc. The number beside each name is the buzzer number assigned to that player. The Test Buzzers screen is optional but it will give both you and your players assurance that each of their buzzers are registering with the computer and that all players are using the buzzer that matches their name on the Enter Player Names screen. As each player presses their buzzer, the computer will display their name on this screen and will also play the sound associated with that player (more on sounds later). Additional buzzer presses will continue to flash the player’s name and play their associated sound. The Get Ready screen alerts the players to get ready for the next question. The player buzzers will not be activated until you press the Spacebar. The Buzzers On screen will then appear and all player buzzers will be activated. Penalty Alert: A unique 2-second penalty feature helps prevent aggressive players from dominating the game by pressing their buzzers too early or by holding their buzzer buttons down. Note: You may choose to activate the buzzers before or after the question is presented. Some quiz hosts prefer to give all players a chance to hear or see the entire question before allowing anyone to “buzz-in.” Others prefer to allow “buzz-in” at any time while the question is being presented. When the Buzzers On! screen appears all player buzzers are active. The first player to press their buzzer while this screen is displayed will win the opportunity to answer the question. Each player will have only one chance to answer each question. If their answer is incorrect, their buzzer will be disabled until the next question begins at the Get Ready screen. The Names screen will display the name of the first player to press their buzzer (the first to “buzz-in”). The sound associated with their buzzer number is played at the same time. This is the player who may now attempt to answer the question. --The R key may be pressed for a R-ight answer, causing a victorious DING sound along with a screen showing a green check-mark (see below). --The W key may be pressed for a W-rong answer, causing the dreaded wrong-answer BUZZER sound along with an explosive BUZZ graphic (see below). --The Spacebar may be pressed to skip this question and return to the Get Ready screen where all buzzers will be reset and the next question may be presented. Player scores are not affected when the Spacebar is pressed. The Right screen is displayed when the computer operator presses the letter R (R-ight answer) on the previous Names screen. This congratulatory screen will appear with a victorious DING sound. The current “right answer” point value is added to the player’s score. All buzzers and keys are deactivated on this screen except for the Spacebar. Press the Spacebar to reset all the buzzers and return to the Get Ready screen where the next question may be presented. The Wrong screen is displayed when the computer operator presses the letter W (W-rong answer) key on the previous Names screen. This dreaded BUZZ screen will appear along with a disqualifying “buzz” sound. The current “wrong answer “point value is subtracted from the player’s score. The buzzer for the player who provided the wrong answer will now be disabled, but any player who has not yet answered this question may still race to “buzz-in” while this screen is being displayed and attempt to answer the question. As always, pressing the Spacebar skips any further “buzz-in” attempts and returns to the Get Ready screen where all player buzzers are reset and the next question may be presented. There's no messy software installation; it just works! Different buzzer sound for each player. NEW! Optional voice downloadsof various dialects permits Easy Quiz to speak at every sound event. Check under the Accessories tab. I received my buzzers in two days! They surpassed all my expectations! In comparison to the other buzzers I have purchased, the quality of construction is far superior. These feel solid, not like a toy! I wish I found your website sooner, it would have saved me alot of time and money. What a concept: a product that works "out of the box" at a bargain price. Check out the competition — this is the most "affordable" option for game show buzzer systems. A definite recommend for quiz game presenters! Just wanted to let you know we received our buzzers today, and they are awesome! The product arrived very quickly, worked like a dream and we were even able to add our own custom buzzer sounds to it. We're thrilled with our purchase. Thank you so much to all the guys at Affordable Buzzers for their patience, help and honesty. I presented my training with ten buzzers buzzing and loads of enthusiasm from the players — it was a great success! ...there was ZERO set up involved besides entering my players' names. What a joy not to have to call tech support or spend an hour to get assistance just to use a product. The buzzers worked great. They are reliable and functioned as advertised. They were a great game show addition for a teenager birthday party. I'm not sure what I'm pleased with the most, the buzzers or the customer service. From my first special request for overnight delivery, I knew Affordable Buzzers believed in good old fashioned personalized customer service. Planning a quiz for children? They will love hearing Emily call out their buzzer numbers and announce Right or Wrong answers. Using Easy Quiz for adult training or review? Michael's voice will add high-energy speech to your quiz to keep your participants engaged. POWER GRIP Hand-held buzzers feature a no-slip design that feels great in your hand and strangely empowering! Easy operation with either your thumb or trigger finger. Molded from ABS plastic, our Power Grip buzzers are made to last. An RCA phono jack in the tail of the buzzer makes cable connections easy and storage convenient. Cables themselves are made with factory molded RCA phono plugs assuring maximum durability. 10' cables standard, 25' cables upgrade available at checkout. Power Grip buzzers are also available in a wireless version. 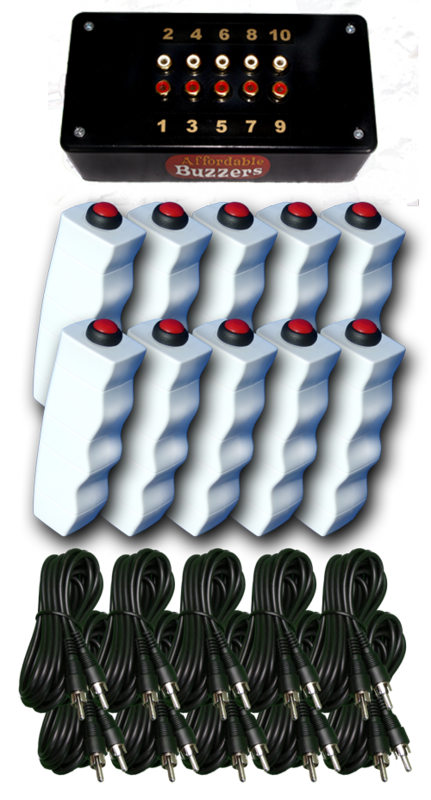 10-Player USB Interface Box is for use with both our POWER GRIP hand-held and Big DADDY table top buzzer models.